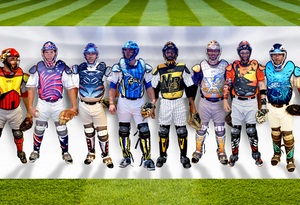 (Denver, CO, April 29, 2016) – The Atlantic League of Professional Baseball (ALPB) today announced a multi-year equipment partnership with Rawlings Sporting Goods by unveiling catchers’ protective equipment featuring original head-to-toe graphics. The dramatic designs feature imagery inspired by core club brand identities, mascots and ballpark communities. They were created by Skye Design Studios of Florham Park, N.J. and will be worn by ALPB catchers during the 2016 season. All eight ALPB clubs will debut sets of Rawlings’ Velo line of premium catchers’ helmets, chest protectors and shin guards featuring artwork customized for each team. Skye Design Studios, with vast experience creating professional and collegiate sports brand identities, supervised the complex task of equipment decoration, which included airbrush, sublimation, vinyl applique, embroidery and other extensive applied art. “This was an incredible opportunity we could not pass up. This partnership is not only with a great league but one that also understands that our business is baseball, and baseball is fun. We welcomed the chance to collaborate with the Atlantic League and flex creative muscle the field has never seen before,” said Mike Thompson, Executive Vice President & GM, Baseball for the Rawlings Sporting Goods Company. The new protective equipment underscores the Atlantic League’s objective to influence the sport of baseball and appeal to new, diversified audiences. The origin of the idea was drawn from designs seen on masks of hockey goaltenders. “We admire the artistry of goalie mask decoration and wanted to build on that idea,” said White. Each of the designs featured on the new catchers’ protective equipment will be available to fans through a variety of officially licensed ALPB merchandise available at club ballpark gift shops throughout the season. Skye Dillon owns and operates Skye Design Studios (http://www.sdsbranding.com), a brand identity and design firm based in Florham Park, New Jersey. Since 2004, Skye has been contracted with both primary and collaborative roles in the development of some of the highest-profile properties in sport, spanning professional and collegiate branding on a national and global scale. Other SDS work in the Atlantic League includes team identities for the New Britain Bees and Bridgeport Bluefish, as well as event identities for the 2015 and 2016 All-Star Games hosted by Bridgeport and Lancaster, respectively.